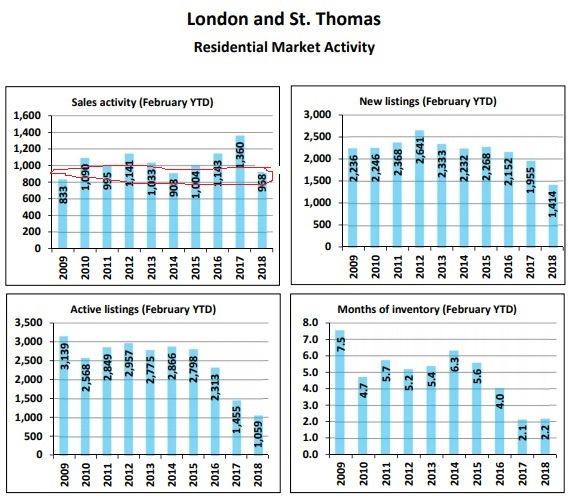 It’s a great start to 2019 in the London real estate market. 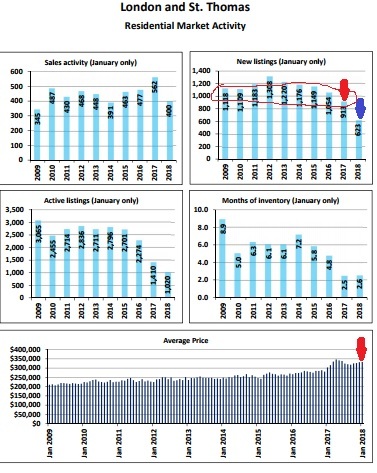 Sales are slightly up from 2018 to 2019, and the real good news comes on the inventory front. We have been talking about not enough homes for sale for months (years) now. We still aren’t back to normal levels, we are starting to head in the right direction. Year to date, we are adding about 6% to the number of homes listed for sale. Considering we are down over 50% from where London typically sits with the number of homes listed for sale, this is great news. Typically in March, we have between 3,000 and 3,500 homes for sale, and we currently have just over 1,400. The closer we come to that 3,000 homes for sale mark, the happier all buyers and a lot of sellers will be. As much as people don’t want their home to be listed for sale for months at a time, it is very overwhelming to have the number of showings and activity in such short periods we have seen recently. 3 of the last 4 homes I have listed for sale, do not want to hold offers and create this kind of activity around their home. They want to list it at market value, and sell it to someone willing to work with their price and terms. Something to consider if you are planning to sell your home in the near future, is you could be missing out on some great potential offers if you plan to hold off looking at offers until a specific date. I have come across many buyers, who aren’t willing to even look at a property if this is how it is being marketed. There are always options on ways to sell you home for top dollar, and if you have questions, feel free to reach out to us, 519.663.9411 or info@pricerealestateteam.com. Welcome back! I missed the January update, for good reason, I was away in New Orleans for 8 days, and had a bought of bronchitis, and didn’t feel like coughing and hacking through a couple of minutes of yammering on. 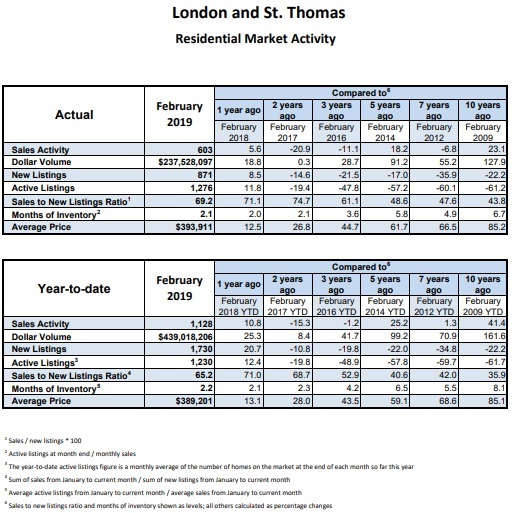 Here is the moment we have all waited for, the February real estate market update for the London area. What can I say, it has been a great start to the year in London. We are up a little bit in active (+136) and new listings (+297) over this time last year. Sales activity is also up by 110 homes year to date. The average price point for all residential property has also moved up to $389,201. 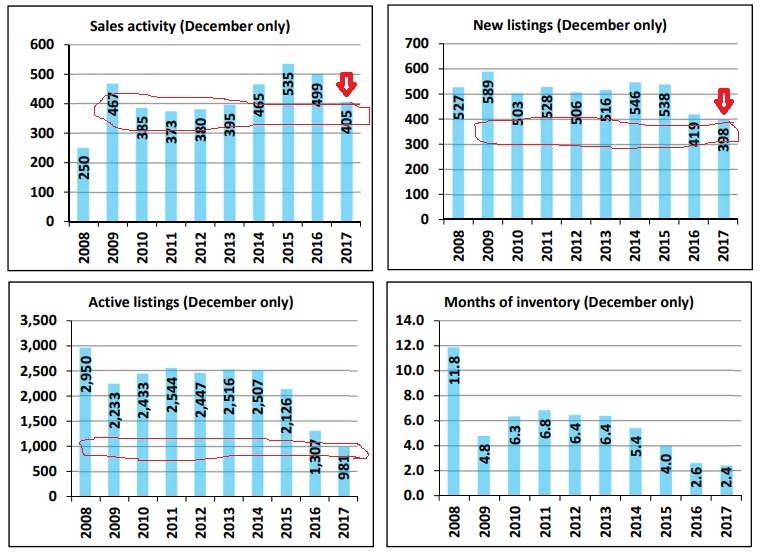 Listing inventory is also still down, compared to the seasonal norms, we have less than 50% of what we typically see this time of year. So how will this come into play for people? For seller’s, it is still a seller market, meaning your home should sell quickly, and quite possibly in multiple offers. Something to consider right now, is reluctance of some buyers to play the holding offers game. I have been showing some people who are not willing to even go see any properties that the seller is holding offers on. If you are going to sell, and attempt to hold offers to attempt to get multiple offers, you need to be sure you price it really well. I have seen some properties not end up with any offers after holding off, and then sitting on the market for a little while. As a buyer, you need to be ready to jump on a great property still. The lack of inventory means you need to get in and see a property asap, and be willing to submit an offer quickly if you like it. If you wait, you may not have a second chance. Below is a look at the rest of the stats for February, have a look, and if you have any questions, feel free to reach out, 519.663.9411 or through our website. Another year in the books, and it’s that time to have a look at what has happened over the last year in London. At least in the real estate world. 2018 was another busy year in the London area. 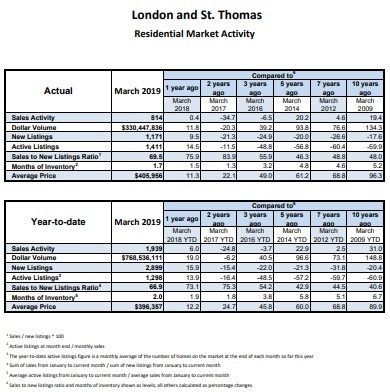 9,799 homes exchanged hands through the London St. Thomas Association of Realtors, and the average price point over the year was $368,705. The number of sales puts us as the 3rd best sales year in history (trailing 2017 and 2016) while we are up 11.9% in sales price this year over last. What do these numbers tell us? Not a whole heck of a lot. We have to go a little deeper to potentially pick up a trend or some real information. If we look back on 2016, we now can see it was a great year in sales in London, and the start of the outside influence on London that kicked sales into gear for 2017. We saw a new chunk of buyers come to the area, fleeing housing prices in the GTA, and added more demand on home purchases than the supply could handle. 2017 was the peak of this demand, and in 2018 we still hadn’t caught up. We just haven’t listed enough homes for sale, to add enough inventory to move us from this sellers market back to balanced. Have a look at the number of listed homes compared to the number of sold homes over the last 5 years. As you can see, there is a serious gap between the number of listed properties from 2014/15 to what the 2018 numbers show. We are getting no relief from people looking to buy, and we have lower than average homes available for sale. It’s the old supply and demand of basic economics. We continue to have high demand, and low supply, and that is keeping prices moving upwards. Unless we see a significant drop in sales, increase in listings or some outside force on those two things, (a large increase in interest rates) we will see more of the same coming our way. 2018 is coming to a close, and it is good news on the real estate end of things in the London area. Homes are still selling, more homes are becoming available, and prices are stable. I am not saying that the London real estate market is perfect by any means. The nice thing, is it seems to be “normalizing” a little bit. For sellers, we are seeing homes still sell quickly, and a lot of the time in multiple offers. 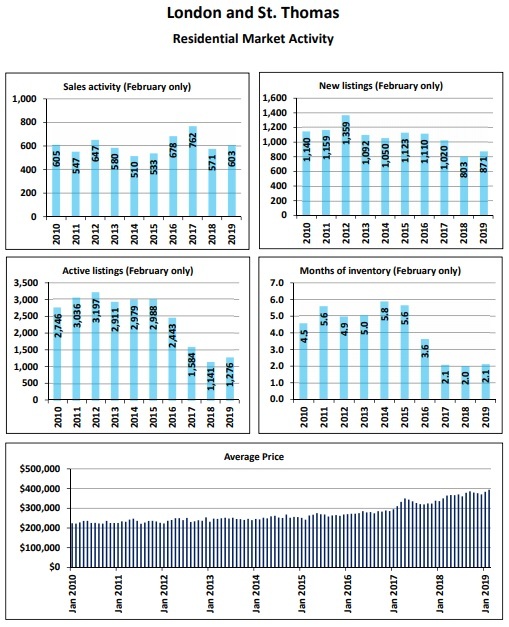 For buyers, we have been seeing more listed properties for sale come available, and prices have stabilized for the time being. 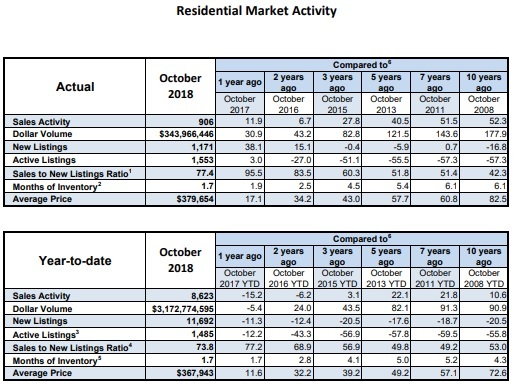 Looking at the numbers, we saw 898 new homes hit the market this year, and I am not worried about that compared to last year (which was 764 homes listed). 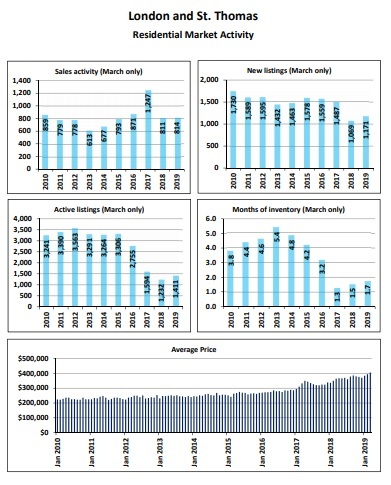 What encourages me the most, is it is back to levels of listings we saw in 2012, 2013. We needed to get back to that 900-ish number. 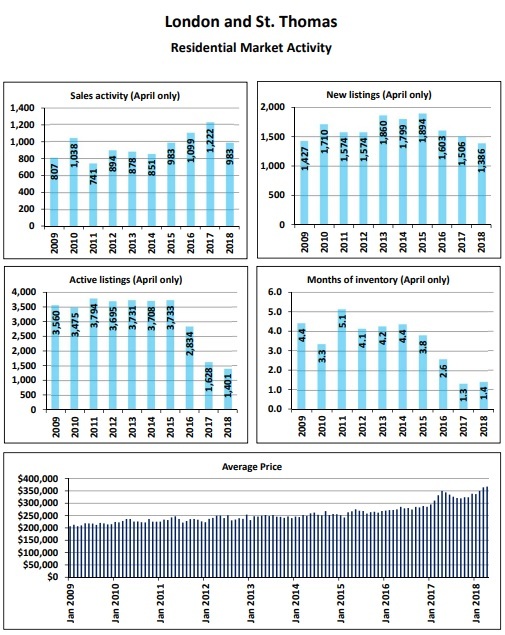 Yes, we also saw a good number of homes sell last month, it kept us at the current inventory level for homes for sale. The number of homes for sale didn’t get smaller. 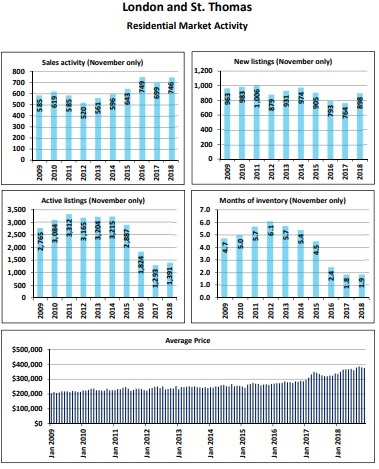 Average sale price month over month is down a little bit, while average home price on the year is up a little. All in all, things are looking pretty good. If you have any questions, or want some more information, please reach out to us, 519.663.9411 or info@pricerealestateteam.com. Busy, busy, busy. October has come and gone, and it’s another great month in London (especially for sellers). The buyer market was pretty good as well, or at least getting better. We listed more homes in October (1,171) than we have listed in 3 years, and sold more in October (906) than we have in the last 10 years. The average home price from September to October slid a little, down about $6,000. Not a drastic change, and with the number of homes for sale still being lower than ideal, we don’t expect that number to drop very far. It is still nice to see more listings than sales in any given month, we still have a need for more listings to hit the market. 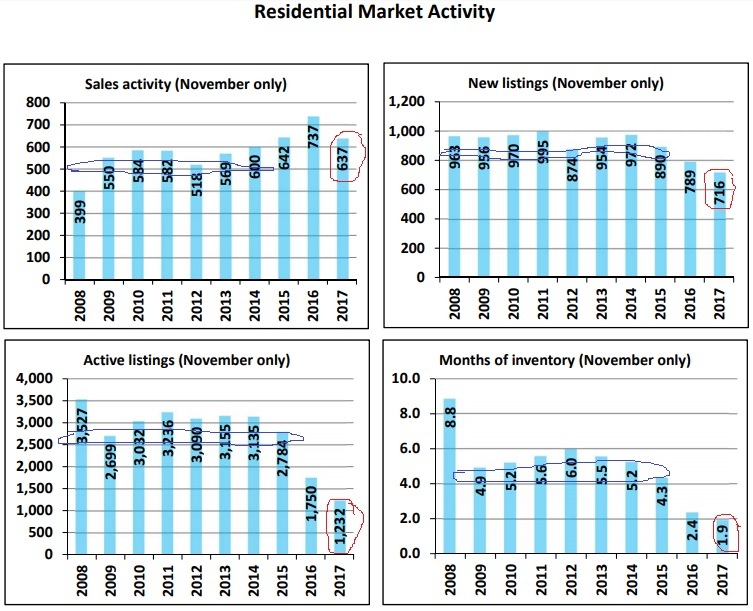 If you are wondering if it is a good time to be listing, heading into the winter, it is. Depending on the type of real estate market you find yourself in, winter can be a lot slower. What we are still seeing, is the buyers are still there, since the inventory of homes for sale is roughly half of what we typically see. That being said, we are seeing inventory creep up, so buyers are having a bit easier time as well. If you have any questions, feel free to give us a call, contact us or drop us a line, 519.663.9411. September is completed, and more homes have sold in London. Weird how that happens…. We are still trailing behind last year (the best year in London’s history) overall though, the London market has been a strong one in 2018. We have sold the 3rd most homes in London’s history. 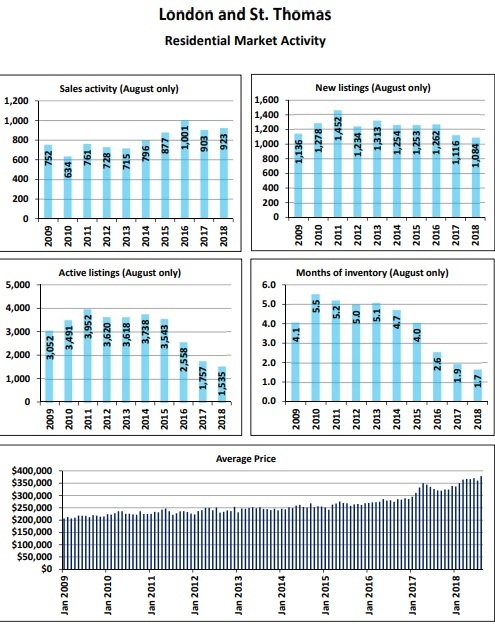 The average price point has continued to move up as well, mainly due to lack of inventory. We are down about 1,600 listings from where we should be this time of year. 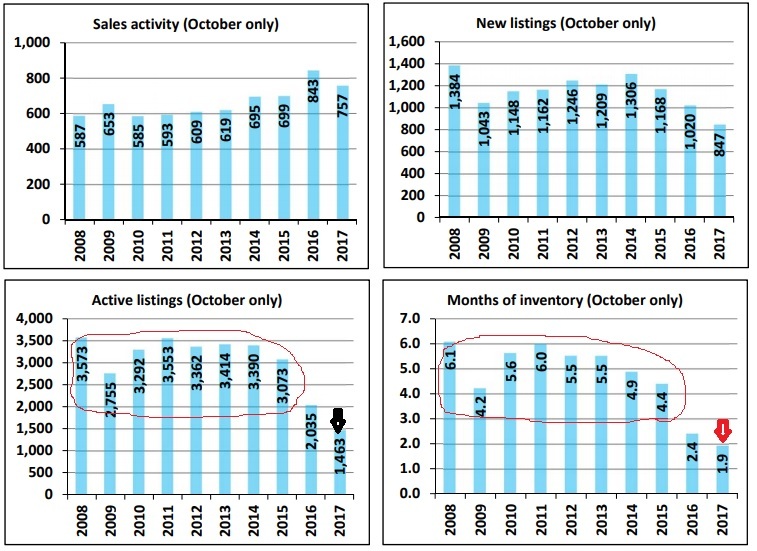 That being said, we had another month of more listings than sales in September. If that trend continues for the next few months, we could get into the 2,000 homes listed range, and that would start to calm things for buyers a little bit. The market is still moving, especially in the sub $350,000 mark, and we are still seeing multiple offers. Above that price point, we have been seeing a little longer time on market (we are talking weeks here, not months) and the ability to negotiate one-on-one with a seller. If you want to chat about your real estate needs, feel free to reach out to us at 519.663.9411 or contact us through our website. Here we are, wrapping up another month, and another summer. I can’t believe pumpkin spice “everything” is out already! 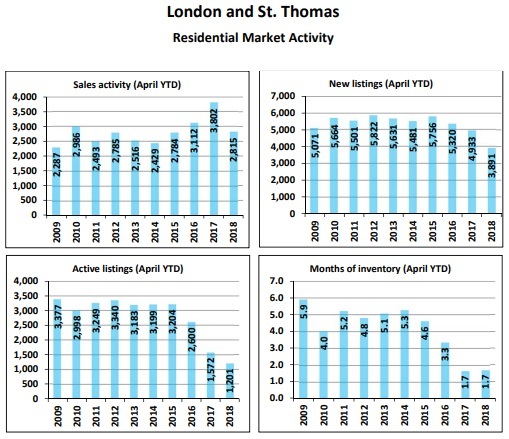 It looks like the rest of the world is finally catching up to what we have been saying for months, that the London real estate market is hot, we are in great shape, sales numbers are great, and the only thing we would like to see change would be an increased amount of homes for sale. We read a news article naming London as #1 in their top 10 hottest real estate markets, and even our Real Estate Association has caught onto that notion. It seems all the talk about housing in 2018, has been the comparison to 2017, which we have said for months, is the wrong comparison. We need to look at the 10 year trend, and eliminate 2017 as an outlier. Some of the good news, for the second month in a row, we have had a surplus of listed properties. We’ve added over 400 homes to our inventory in the last 2 months, and a couple of more months like this, will really ease the pressure on buyer’s in the area. The statistics below will spell some of that out for those who like working through numbers. If you want to ask any questions about the London real estate market, feel free to contact us, 519.663.9411. Another month in the books, another great month in the London real estate market! July went by, and we are right in line where we should be for homes sold (1,000) seeing 1,018 last year, and 1,004 in 2016. The biggest positive on the month, was the increase in listings. 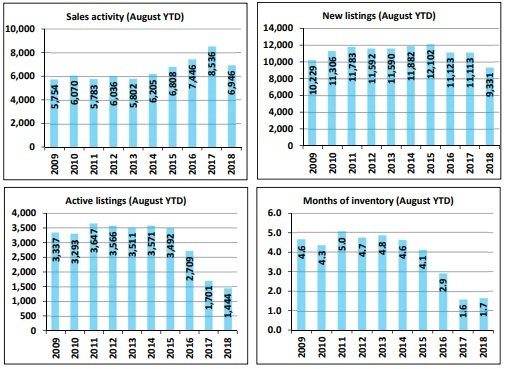 We listed 1,268 homes, giving us a surplus going into August, and if we see a few more months of more listings than sales, we will be getting closer to that more balanced market which makes it a bit easier on the buyer side of the real estate transaction. 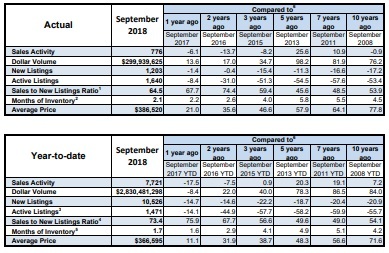 The surplus of listings is probably why the average sale price is a little lower for July, than it was in June. Not a big deal, we see minor fluctuations month over month all the time. Within The Price Real Estate Team sales, we did notice fewer multiple offer situations for our buyers. And fewer multiple offer situations will cause a bit of a drop in average price point. 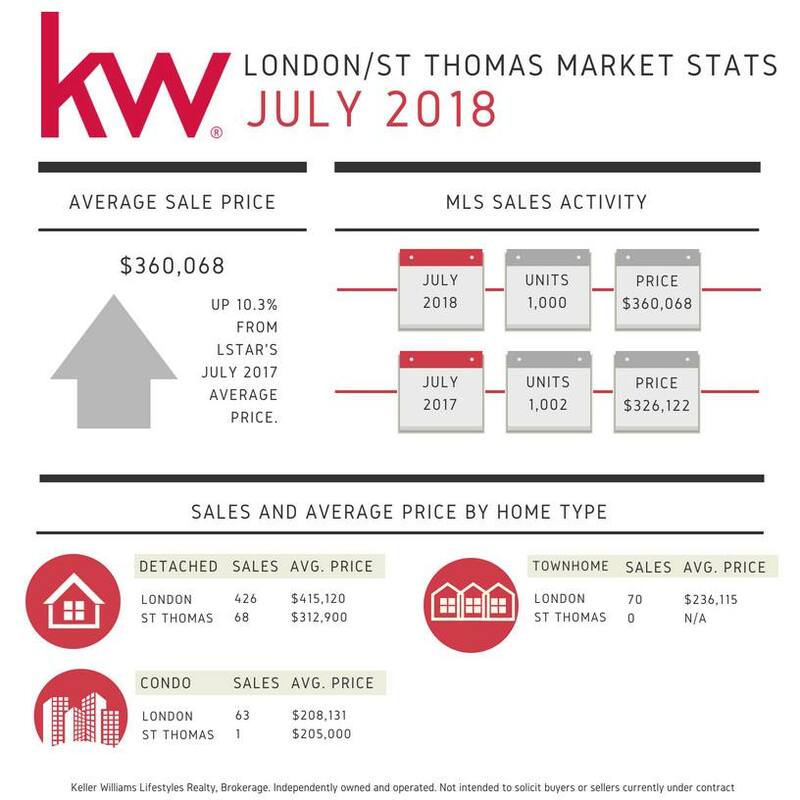 On the year, average price in London is $362,206 while July was $360,068. 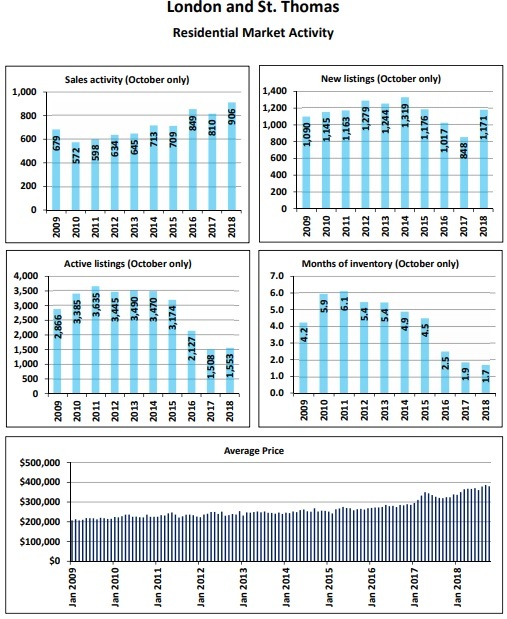 Have a look at the charts below for more data, or reach out to us at The Price Real Estate Team, 519.663.9411. Wow, we are flying through this summer! And it’s that time to get fun and crazy with some statistics…. ok, thankfully not a ton of numbers. Just like this summer, the London real estate market just keeps on rolling along. 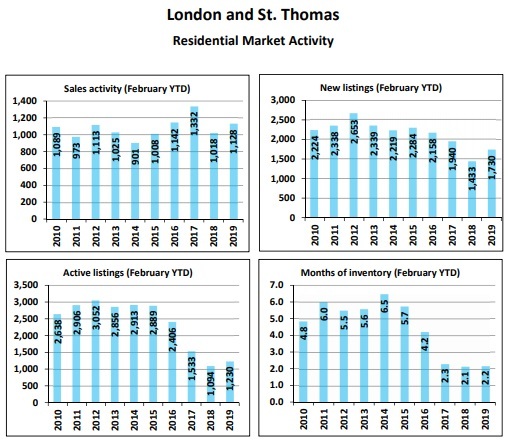 No real gains in inventory, and the demand from buyers is still there, which keeps the average sale price in London trending upward. Couple things to consider going forward, we need to eliminate the 2017 real estate year as a blip, or an outlier. 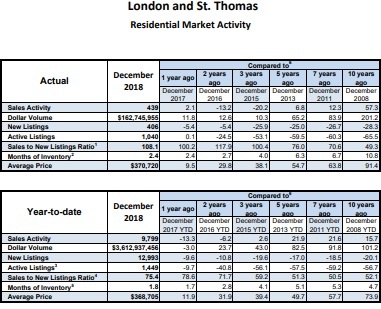 If we remove the best real estate year for sales ever in London (by a long shot) this year is right in line with London’s historical performance. 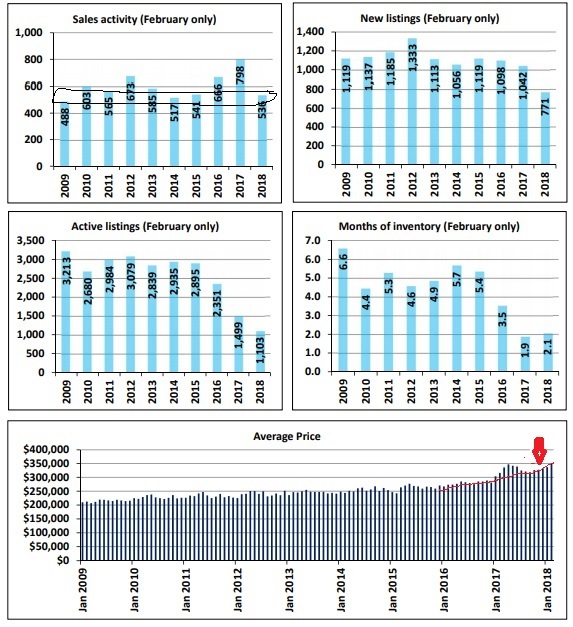 Average price point is the only thing being pushed up, due to lack of inventory. At this point of the year, sellers also need to adjust their expectations on how to sell their home. We have seen quite a number of homes attempt to garner multiple offers by holding offers until a specific date, and come that date, no offers come in. It will eventually sell a little while later, just not with the same speed. If you are planning to sell, and are wanting to hold offers to a specific date, you will need to be aggressive with your price, and I know a lot of sellers are not comfortable with that. Another month in the books, another opportunity for me to get in front of a camera! All kidding aside, May 2018 looked very similar to the rest of 2018, with a little hope of the market shifting towards balanced again. It won’t happen right away, the signs are there it could be happening. Earlier in the spring, when listing and selling a property, as long as it was priced well (or a little low) it was pretty standard to see 10-14 offers on a property on almost anything listed for sale under $500,000. Over the last few weeks on our listings and any offers we have been submitting, we are seeing 3-4 offers in a multiple offer situation. Not that anyone likes to compete for a home, it makes it a little more tolerable for anyone on the buyer side. In the chart below, you will notice we are still light on the listing side, year to date, and in the month of May. There is definitely movement though, not everything is selling right away, and I have even been able to purchase a few homes with my clients where we didn’t have to compete! 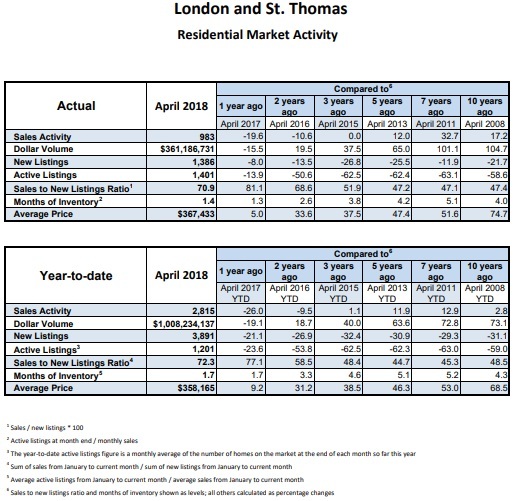 And for all the talk we have heard about a “slow down” in the London real estate market, notice we have sold the 3rd most amount of homes year to date, in the last 10 years of data. Of course last year being the banner year for home sales, we are lagging behind that number that everyone likes to compare us to. If you throw out last year as the anomaly, sales numbers are quite fine. 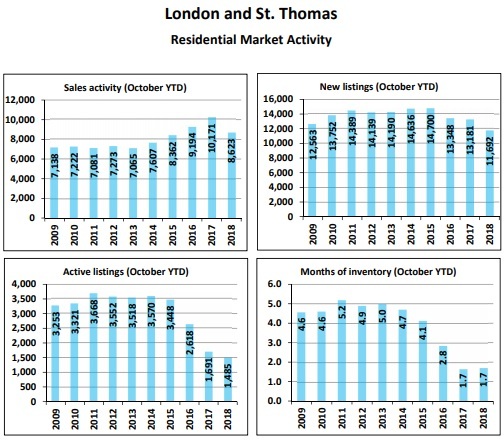 Another month in the books, another real estate market update for the London/St. Thomas area. 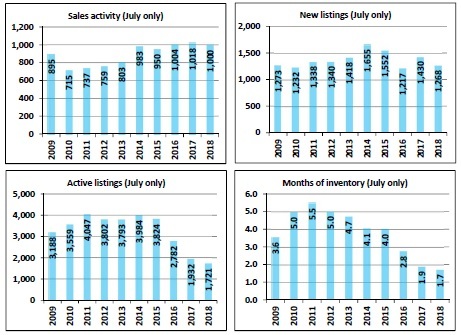 Inventory (or lack there of) continues to be the topic of discussion. We sit at historical low numbers for listings, and yet homes continue to sell, and the market shows no signs of slowing at this point. April continued to see a short time on market, some multiple offers and our average price in London on the year sitting at $358,165 and for April alone it was at $367,433. It’s a great time to list your home, as the market continues to crave listings. As a buyer, you need to make sure you are ready and willing to act when needed. It’s not a market where you have a night to “sleep” on a decision. 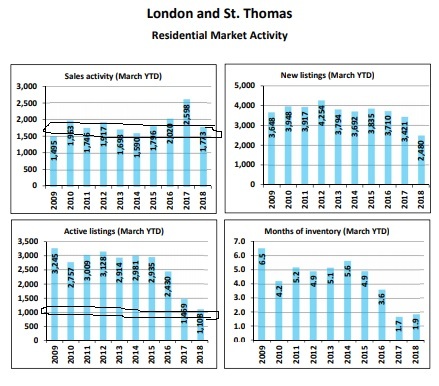 Working our way through the spring (or at least I believe it’s spring, Mother Nature has other thoughts) and we are now getting to a point we have enough data to start comparing the spring of 2017 to the London real estate market trends over the last decade. Of course the talk continues to be how 2018 compares to 2017 in the real estate market. The problem with that, is it isn’t enough data to get an accurate representation of the what is really happening. What you are going to hear on the news is how sales are down, and inventory is down. And both of those are correct in a one year snapshot. 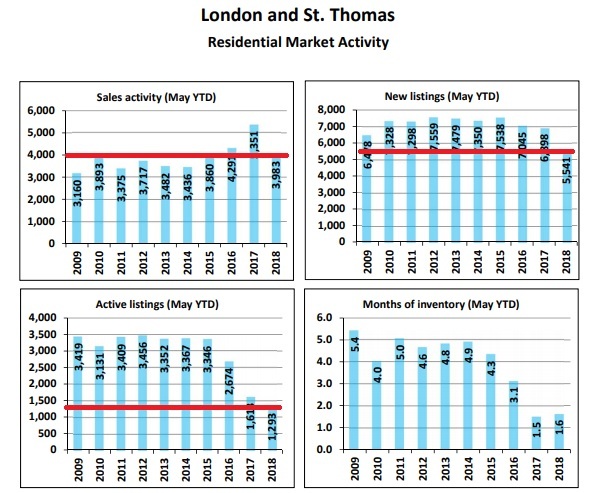 If we look at the last 10 years, we will find our sales data is right in line with London home sales. The last ten years of sales in March look like this. 662, 873, 751, 775, 664, 682, 792, 877, 1 238 and 769 this year. Other than last year, the rest are all very similar. Year to date (Jan. through Mar.) looks like this. 1 495, 1 963, 1 746, 1 917, 1 698, 1 590, 1 796, 2 020, 2 598, 1 773. It’s a little lower than what the average would be year to date, just not the 30% down that we see 2018 over 2017. Inventory is still low, and that lack of supply is what is causing our average price point to push up higher than a usual number for London. We are up 8.6% this year, if we had more homes available for sale, that number wouldn’t be quite as high. 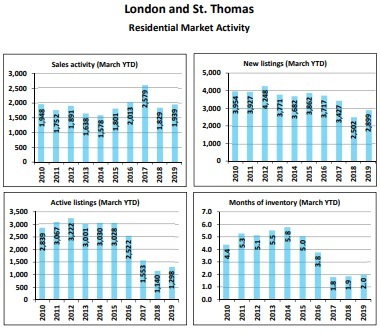 Another month in the books, and another London Real Estate Market update for you. The talk that has been around real estate in London this last week, has been from a headline in the Free Press about the real estate market slowing or being slow in our area. I would like to dispel that myth. It’s a great headline, just not accurate. Yes, we have sold fewer homes in the London area in the last month, and in 2018 as a whole compared to 2017. However, when we compare that to the historical numbers, or in the 10 year trend, you will see we are right on pace with previous years. And to refresh everyone’s memory, 2017 was the year London saw the most homes sell, ever. If you look at the charts below, you will see what I am talking about for home sales. At the very bottom of the chart, you will also see the average price trend, and I highlighted the path of London’s price gain. Notice how the 5 to 6 months of last year’s spring jump up above the trend line. Little blips like that happen periodically, the overall trend is still in line without that activity, and that is what is important. Our trend of not enough homes for sale is still going on. The buyers are out there, we don’t have enough homes for them all! The last 2 offers I have done have both had multiple offers, and the showing schedules have been quite full with Realtors either lining up to see the property or multiple agents and clients going through the house at the same time. That being said, it is an amazing time to list, snow and cold doesn’t seem to matter. Even with the action in the real estate market, it is still an affordable time to buy. To rent a 2 storey, 3 bedroom house in an average neighbourhood, your rent will be $1,600-1,800 a month plus utilities. If you were to buy a home at the London market average sales price, $333,000, with 5% down, 25 amortization and a 3.5% interest rate, you would have a $1,600 per month mortgage payment. When you own your home, you are building equity, which is a form of forced savings, rather than build someone else’s wealth. If you already own a home, and would like to start building your wealth through real estate, we can help show you how you can build that wealth. Happy New Year! Time for a recap of the London real estate market for 2017, mostly the month of December though. 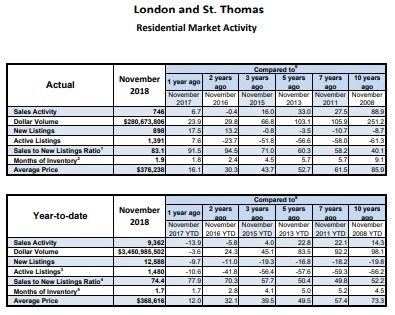 When you take a step back, and have a look at the growth the London real estate market saw in 2017, it really only happened over a 4-5 month period. If you remove that blip from End of March through early July, London pretty much performed on a similar trend to normal. 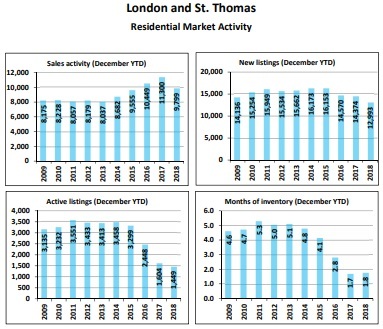 The one thing keeping London in a Seller’s market, is the lack of inventory. What we need, is for everyone that is thinking about selling to list their home, instead of waiting to buy their new home first, because there isn’t enough choice on the market for them to make a move. Of course that isn’t going to happen overnight, heading toward spring, we just need to see a higher pace of people listing their home for sale than the typical year so we can catch up and get back into a balanced market. 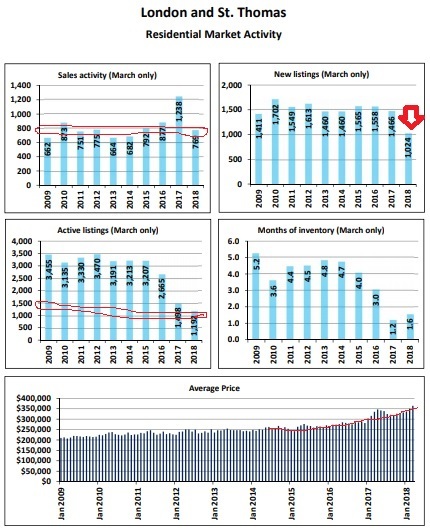 We have seen in the previous months how our sales activity during the historical months has been similar, but new listings is considerably down. 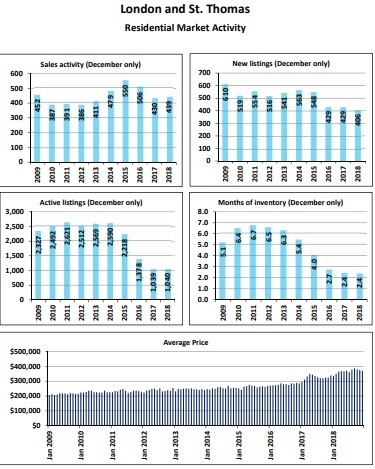 To throw a few numbers at you, December usually sees around 400 sales (this year 405) and typically 520 homes get listed in December (this year 398). That puts us another 120 homes behind where we would be. Right now we have 1,500 homes (give or take) available on the market for sale. So what has caused this? Well, plenty of things. Without guessing at what people are feeling, let’s just look at verifiable information. London’s vacancy rate for rentals is extremely low. The last number I heard it was under 2%, making this a very good market for investment property owners, so we see more rental owners rather than owner occupied homes, so fewer homes available to families to buy. People forced out of the Toronto area due to housing costs, or looking to take advantage of the price gap added more buyers to the mix that traditional weren’t there in the same numbers. With the price point in London going up about 20%, that has added worry to some about affordability when it comes to moving up into their next home. And when people get worried, they bunker down. With the normalizing of the London market, the Toronto buyers slowing, here is to sellers becoming more comfortable and listing their homes and getting us back to a balanced market. Happy December 2017! We are almost at the end of the year, one month more of home sales and home purchases in the books, and Jason Cheese, real estate sales representative from The Price Real Estate Team is here to update us on the past month’s market. November brought us a little more of the same we have seen the past few months. The average home price in the London area for November was $322,000, down a tick on the overall 2017 annual average sale price of $330,000. 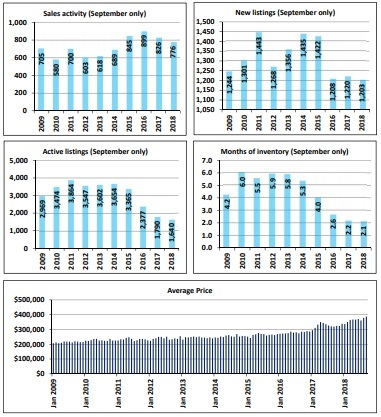 This is pretty typical, since the spring market is usually the most active, and we see the top of the price curve at that time during the year, and as inventory and sales slow down heading towards winter, we see the price slide a little. 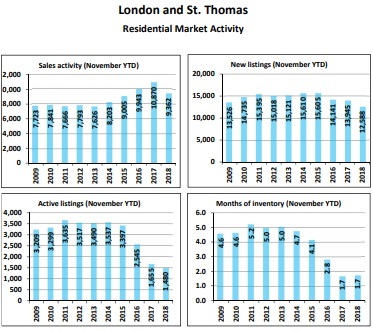 In November, London listed 1,232 homes, and that is about 40% of what we typically see this time of year, normally around 3,000 homes are listed. Sales activity is still up, we had 637 homes sell, and typically we see around 550 sales in November. This means, for anyone thinking of selling in the upcoming year, you may want to consider listing a little earlier than planned. With this lack of inventory for buyers to choose from, and there are plenty of buyers out there, you may want to take advantage of the current selling conditions. Worst case scenario, let us come in and give you a market evaluation, and start the process of getting you ready for sale in the spring. For buyers, stay ready. I know it is tough sometimes, jsust know the right home is coming. Be prepared and ready to buy when that home gets listed, and if you need a little help and support, you can reach us at 519.663.9411. Welcome to November 2017! Time for a London real estate update from Jason Cheese, buyer agent for The Price Real Estate Team. Things in London are pretty much staying the course from October, and last few months. Total home sales were down this year over last year (757 sales 2017 vs. 843 sales in 2016). Not a huge drop, and still has us up on the year. 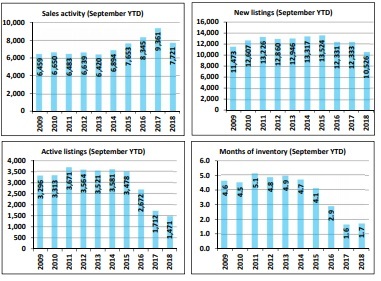 New listing inventory is also down, we had only 847 new listings in October 2017, as opposed to 1,020 in 2016, continuing the trend of less listing inventory. Active listings in London, we have 1,463 listed properties, last year we had 2,035 listed. In 2008-2015 we were mostly over 3,000 active listings. From last year to this year, a drop of 28% in listed properties is large. Over the past 5 years, we are down 56%. What this means, is we still have multiple offers happening on properties, and prices are stable. If you are considering a move, or selling an investment property, a lot of people like to wait until the spring for a hot market. We are still cooking in London as far as sales go, and with inventory as low as it is, the time is now. You can wait for spring, and hope a bunch of competition doesn’t show up in other people looking to sell, or you can list now and be the only property available or have little to no competition.